Surprisingly creative once set up, and great on drum kit recordings, MDrumLeveler offers a new approach to dynamics. Powerful alternative dynamics effect. Great display options. Handy detector prefiltering. Excellent output envelope for shaping. Useful output gate. Extreme settings can deliver crazy effects. Multiple target levels can be tricky to negotiate. Melda's MDrumLeveler (VST, VST3, AU) mines very similar territory to Sound Radix' Drum Leveler , offering a powerful range of options for drum dynamics management. Designed to both stabilise hit levels and remove leakage and ambience along the way, it can be used in conjunction with - or to completely replace - traditional processors such as compressors and expander/gates. "It's flexible and powerful, enabling a degree of precision that traditional compression and expansion can't match"
MDrumLeveler's two thresholds (Threshold and Threshold Max) define the range of levels within which drum hits are targeted for processing. You can use this to target single specific levels (a kick drum struck with full force, say), or set a broader depth to treat a range of levels. 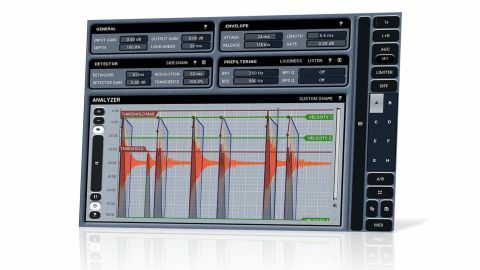 Thresholds and target levels (Velocities) are controlled using the horizontal line markers in the main Analyzer display, which also includes a real-time audio waveform with three coloured components: Input, Output and Sidechain (internal or external). The Analyzer is also overlaid with indicators showing data such as detected hits and the applied envelope curves. To further fine-tune how MDrumLeveler responds to drum hits, you have the General, Detector and Prefiltering sections. Detector includes stuff like minimum time between successive detected events (Retrigger) and overall detection window time (Resolution). Less obvious is Transients, which dictates the sharpness of what the plugin considers a transient. Prefiltering employs two band-pass filters with adjustable Q to preprocess and focus the detection signal (for instance, on a snare mic, you might tune the plugin to the snare drum's frequency, so that it ignores bleed from the kick and toms). Finally, General parameters include lookahead time, in/out gains and - most significantly - the overall processing Depth, which controls how much corrective gain is applied. Think of it as like a compressor's ratio: at 100%, detected hits' levels will be completely leveled out so that they each match the target Velocity. Having the most dramatic effect, though, is the Envelope, which defines an amplitude envelope (Attack, Length, Release) applied to all detected hits. It also has a Gate for removing unwanted sounds between processed hits. MDrumLeveler ships with a library of starter presets, including some compressor/expander style settings; but the most effective way to proceed is to get stuck in with the thresholds and target levels. Setting these is essential to getting the plugin 'reading' your hits correctly, after which the output Envelope shape and processing Depth can be tweaked. The more complex the material, the harder this is to do, but in testing, we could tweak even a full stereo drum mix very effectively. We also found the Prefiltering incredibly helpful when trying to focus our processing towards specific drums. MDrumLeveler's output envelope is capable of seriously reshaping the sound of processed hits and, at extreme settings, delivering weird and wonderful effects. In that particular regard, it feels very different to Sound Radix Drum Leveler, where reshaping is limited to the Hold and Recovery parameters, and better suited to extensive processing (ie, level and shape) of individual multitracked drums. While that might make it sound like a regular dynamics processor, it's actually far more flexible and powerful, enabling a degree of precision that traditional compression and expansion can't match.